Also in Amsterdam 2000 people demonstrated on 23rd! Thank you all for the great demonstration with up to 5000 people!! Nation-wide mobilization more and more successful! „The Refugees‘ Revolution demonstration of 23.03.2013 with over 5000 participants again sets a strong signal against our exclusion, isolation and inhumane living conditions. It is an unequivocal rejection of a government policy of ignorance, repression and blockade against our claims and actions. Another major success of the r efugee-protestslies in the ever-growing participation of the self-organizing fugitives from many cities throughout Germany who followed our call(including Frankfurt / Main, Leipzig, Hamburg, Hannover, Braunschweig, Wolfsburg, Magdeburg, Passau, Regensburg, Würzburg, Nuremberg Bayreuth, Halberstadt, Bitterfeld, Halle, Munich, Karlsruhe, Stuttgart, Cologne, Bremen, Deutschland, Rostock and Kiel). No repression by state authorities against the one year long refugee-protests, no police attacks against the Refufgees Revolution Bus Tour could stop us. Neither denied leave passes through immigration authorities nor police checks during the journey to yesterday’s demonstration with temporary detentions took effect. VERY IMPORTANT !! COME ALL!! NEW POWER! NEW STRUCTURE ! NEW FIGHTS! Please let us know whatever kind of repression you face on your way to Berlin! Big demonstration also in Amsterdam on March 23rd! TODAY 20th: Welcoming the Refugees‘ Revolution Bustour! SHARE IT! Mobi-Video Demo 23.3. The Refugees Revolution Bus Tour has again been subject to severe police violence and repression. 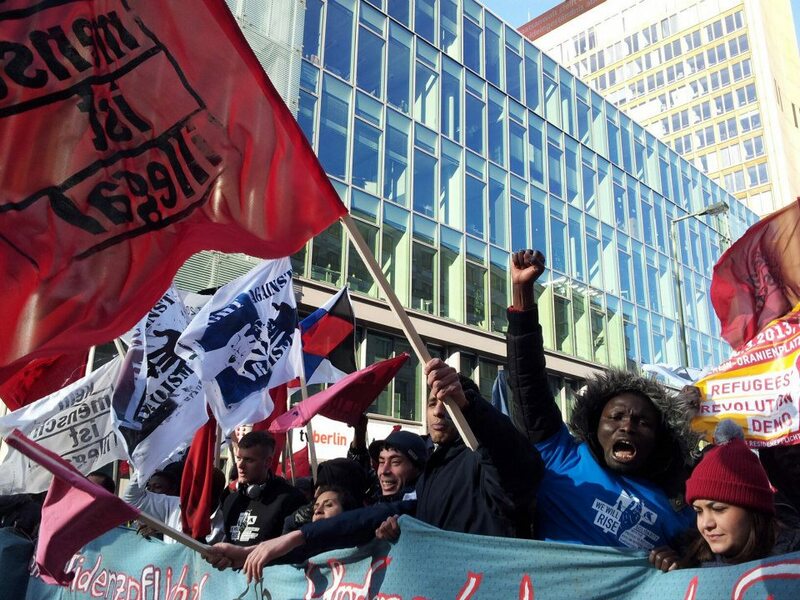 Following the enormous extent of police repression and violence in Karlsruhe and Cologne as well as the general police presence on most other tour stops, the racist police state has again shown its ugly reaction to our antiracist, anticapitalist refugee struggles. YouTube Channel for RRBT is up! We visited a Lager in ( Horst ) about 52 km far from Hamburg.Its the most worset lager we visit so far. The lager is located in quite isolated area in a very small village about 7 houses. One the way to the lager the police was waiting for us.crossing a forest which led to the lager.We just passed the police forcely.We said to the police that no reason to stop us in the street. We arrived the lager.it was surrounded by tens of the police cars. We had an action in front of the lager a few refugees joined.we have heard that from some of the refugees that the lager mangment sold out some of the refugees to talk to the other refugees not to come out and join the bus tour action.and making kind of propagnda that those who are joining the bus tour are radical and they may effect your asylum case if join them. At 16:00 we got back to Hamburg where we spent one more night. On the way from Oldenburg to Hamburg we have been visiting a lager. The lager belongs to Oldenburg. The police came after we entered the lager saying that we are not allowed to be in. We said we already talked to the representative of lager and he allowed us to came in. The police said he got phone call that we entered illegally and gave us 10 min to leave the lager. We were already distributed our flayers and talked to a great number of the refugee so we invited them to come out to attend the action in front of the lager where we held speeches and played music. We had a press conference in the center of Bremen at 10am.up to 150 attented.a great number of the media too. At 13:00 We took leave to Oldenburg where we attented a workshop about Rasicm orgnized by local activitists and refugees. at 17:20 We have been visiting a lager in Oldenburg.We were not allowed to get in but we found a way to distribute flayers and invite refugees to come out and talk.some of them responded to our call. some of them joined us to the workshop in the evening. 20:30 We had a workshop.We consentrated more on the police incident in Kolon and Karlsruhe. We have showed films and pic of the bus tour materails. We Have been visiting three lagers.there wasnt any trouble in geeting in the lagers.The police were following us where we go with out any kind of investgations. One of the lager we visited is the first main lager where you do the interviews staff.most of them are living there for a few weeks.It was great to see those who are in Germany for quite short time and to let them know how the refugees system works in Germany. In the evening we had a workshop which one of the greatest workshop we had during the tour.up to hundred attented. We have visited a lager in Hannover at 13:00.As usual we were not allowed to get in.Five min later the police arrived then the police had a long talk with the house master of the lager that those refugees who are joining the bus tour are radical group and not allowed them to get in other wise you will have to take the responspility. We have been insisting in convince the house master to let us in finaly he said Ok we may come in but we will have to show our Ausweis .We said we dont believe in this Auswies and we will never show them. then the house master said that five of us can come in.One of the police and the house master folllowed our represntitives they showed them a room where they can meet the refugees instead of visiting rooms.We said we are here to talk to the refugees freely not under the police control nor the house master so we refused sitting in that room and we left. We found a way to distribute flayers and talk to some of the refugees. At 16:00 we have started the demo.up to 150 joined us.we have been marching until the center of the city.We havent any kind of trouble with the police beacuse the demo was registred. At 20:00 we a workshop. We havent been visiting any of the lagers in Bouchm. We were runing late from Kollon because Some of us got released to late after the police incident in Kollon. We had a workshop in the evening. 11.03.2013 – Solidaritäts-Demo with BusTour in Berlin from Ihre Merkwürden on Vimeo. We had a press confrence at 10:00 in Stuttgart.Then We left to Karlsruhe.We have been visiting a Lager there.A very big Lager .hundreds of refugees are living there in a very bad condition.We were not allowed to go in but we entered by force.They police was present too but we told them that we dont care anymore. We have started our action in front of the lager entrance after we distributed flyers & posters. 10.03.2013: Die Kölner Polizei greift Refugees‘ Revolution Bustour brutal an, verhaftet 19 Aktivist_innen und verletzt mehrere Menschen schwer. Wir, die streikenden Geflüchteten in Berlin und unterwegs, verurteilten den wiederholten Angriff auf die Refugees-Bus-Tour und ihre regionalen Unterstützer_innen. Schon am 08.03.2013 kam es in Karlsruhe zu wilden Angriffen der Polizei, siehe indymedia: Soli Demo Karlsruhe. Vorwand für die Attacke in Köln mit Schlagstöcken und Pfefferspray war, dass Flyerauf dem Gelände des Flüchtlingslager Geißelstraße in Köln-Ehrenfeld verteilt wurden. Noch immer sind 2 Geflüchtete in Gefangenschaft und sollen u.U. dem Haftrichter vorgeführt werden. KOMMT ALLE und zeigt EURE SOLIDARITÄT !! Sagt es allen weiter! Bringt Megafone/Lautsprecher mit! 23:30 Uhr: one person who was in hospital is arrested now too! entlassen, mehr ist aber nicht bekannt.zur zeit zumindest. personen sind nicht bekannt, der anwalt wird nicht reingelassen. öffenliche Pressekonferenz am 11. März 2013, 11 Uhr Allerweltshaus Köln, Körnerstraße 77-79 ein. Mit Schlagstöcken, Pfefferspray und Hunden ist die Polizei am Sonntagnachmittag in Ehrenfeld gegen Demonstranten vorgegangen, die gegen die Abschiebepraxis in Deutschland protestieren. Die Gruppe hatte zuvor Handzettel in dem Wohnheim verteilt. Bei der Personalienfeststellung kam es dann zu Tumulten. Laut der Protestler setzte die Polizei auch Schlagstöcke und Reizgas ein. 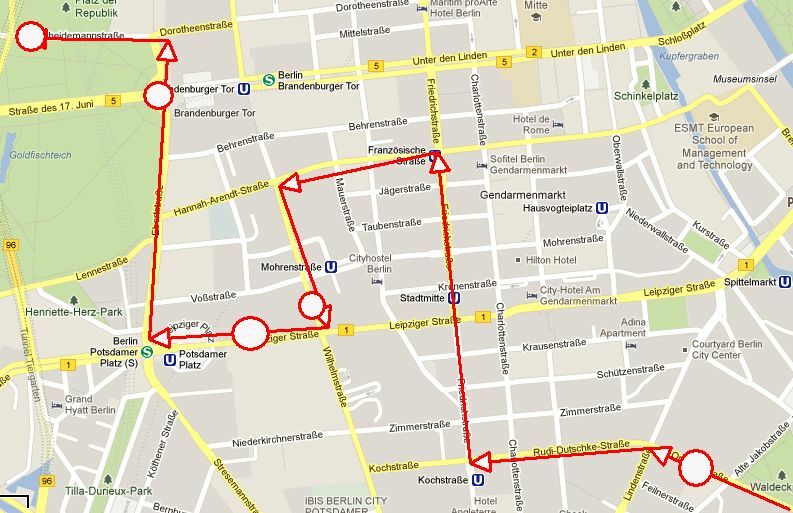 FB 23rd March: Refugees' Revolution Demo 2 P.M.